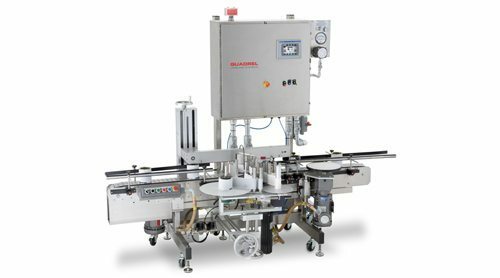 Designed for the harshest environment, this custom system features corrosion-resistant 316 stainless steel components including conveyor, label applicator, applicator support, wrap station and rails. Additional features include color touch screen operator interface, Allen Bradley PLC control and pressurized/vented stainless steel electrical enclosure. This system applies wraparound labels to a wide variety of glass and plastic cylindrical containers ranging in size from 1 liter to 4 liters.